Gal in the Middle: Congrats to the Winner...Time to Head to the Indiana State Fair! Congrats to the Winner...Time to Head to the Indiana State Fair! 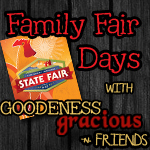 And now one of my lucky blog readers gets to experience the fair courtesy of Indiana Soybean Alliance as part of our Family Fair Days with Goodeness Gracious -n- Friends! Congratulation Sterrett! Just e-mail me your address to the email in my profile and Indiana Soybean Alliance will get your tickets in the mail tomorrow. If your kids REALLY want to visit the Midway, I suggest you check out the deals on the Fair's web site. The wristbands look to be the best deal. The Midway has a great mix of rides for all ages AND even has a log ride to cool you off! Drink lots and lots of water before, during and after your visit so you don't get dehydrated. There are LOTS of water fountains across the fairgrounds! Spend some quality time in the air-conditioned building. Especially Pioneer Our Land Pavilion, Ag/Hort Building, DNR Building and the Indiana Farm Bureau Building. If you want to beat the crowds, plan to be there early (the fair officially opens at 10 a.m., but you can get in a bit early and maybe visit the livestock barns before the rest of the buildings open) AND go on a weekday! And here's my biggest tip to beat the heat...grab your food and head to the Pepsi Coliseum. It's usually nice and cool AND there's usually something happening in there - a livestock show of some kind. A comfortable seat, cool air AND a show - what more can you ask for while enjoying some yummy fair food! The Indiana State Fair runs until Sunday, August 22, so there's plenty of time to enjoy it. I'll be back out there today, Friday, next Wednesday and the entire last weekend! Thanks to Indiana Soybean Alliance, American Dairy Association of Indiana and Indiana Beef Cattle Association for the tickets and food at the fair!